Teachers in Ghana train in Applied Scholastics educational methodology. In 1972, a group of teachers searching for a way to resolve their problems with student learning and classroom management discovered Study Technology—a system of educational tools developed by American author and educator L. Ron Hubbard. So effective was this methodology, that these professionals then decided to start an organization dedicated to sharing it with others. The result was Applied Scholastics. Today, nearly forty years later, that same organization, Applied Scholastics International, coordinates a network of more than 760 schools, community centers, tutors and teacher training programs in more than 70 nations. Altogether, these efforts have reached over 28 million people. 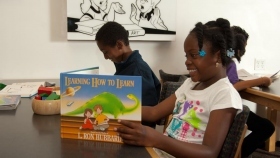 The Hollywood Education and Literacy Program tutors students of all ages. Virtually from its inception, Applied Scholastics-licensed private schools have used Study Technology with consistently stellar results. For example, the Delphian School opened in Sheridan, Oregon, in 1975 and has since grown into a network of seven schools nationwide. Delphi students routinely average a full two-year lead in academic skills over the national average as measured by standardized aptitude tests. Delphi students regularly score in the top 7th percentile on Scholastic Aptitude Tests, while Delphi kindergartners compare to second graders and Delphi tenth graders compare to high-school graduates on the California Achievement Test. The Delphi student, regardless of age, typically tests 25 percent higher than national norms. And in an age when reading books is a lost art, the typical Delphian student is well-read. Required lists for high-school students include Plato’s Dialogues, The Canterbury Tales, Macbeth, Les Misérables, Far from the Madding Crowd and T. S. Eliot’s Murder in the Cathedral, to name but a few of the hundred or so sophomore titles read each semester by 16-year-old Delphi students. Finally, and perhaps most important of all, the Delphi student uses what he has learned; he applies it and builds upon it—all underscored by his postgraduation success, whether in a university or on the job. Similar levels of student success are achieved at California’s Ability Plus School, at Florida’s A To B School and a dozen more institutions devoted to teaching exclusively with Study Technology. Early in its history, Applied Scholastics devoted major resources to bringing the benefits of education to underserved populations. In 1975, Education Alive was formed in South Africa. At that time, the country was still in the grip of repressive apartheid policies and education in Black African communities was in an appalling state. Of every 100 black children entering segregated schools, only one finally qualified for higher education. Of those remaining, only four earned minimal diplomas from high-school. Moreover, 10 million Black children had never spent a single day in class. Education Alive brought study methods to African students and teachers. The program rapidly expanded from one district to several, reaching thousands of students and instructors. The results are legendary. After a three-week course in Study Technology methods, teenagers from the Transkei (now part of the Eastern Cape Province) were found to have increased reading levels by more than two years. At a Bapedi lower primary school, a previously “impossible, retarded or bluntly stupid” class suddenly boasted a seventy percent pass rate, well above the national norm. Consequently, and fueled with corporate donations, Education Alive rapidly expanded until today with Study Technology it has reached some 7 million students and instructors. With federal support, Education Alive continues to grow and is an important part of the South African government’s Reconstruction and Development Program. Applied Scholastics has also brought Study Technology to the People’s Republic of China. Upon invitation from the faculty of Beijing University, Applied Scholastics trained teachers at a Beijing school and made two fifteen-minute Study Technology videos that were played twice to an estimated 50,000 viewers per broadcast. This created such a demand for Study Technology that the 20,000 first editions of the Chinese version of the Learning Book sold out rapidly. More than 5,000 Chinese teachers and industrial managers have been trained on Study Technology. Likewise, Applied Scholastics is very active in the country of Costa Rica, where it has reached 2,200 schoolteachers while, at the same time, delivering Study Technology to major companies and government officials. Following the Los Angeles civil disturbance in 1992, a Compton community organization incorporated Study Technology in its efforts to turn at-risk youth away from gang life. This program grew and became the World Literacy Crusade with additional centers in urban areas. It has now helped several thousand youth in the Los Angeles inner-city area get their lives back on track by providing them with effective learning skills. Also, an Applied Scholastics organization which originally opened in Russian in 1993 has since provided training in Study Technology to the Ministry of Education, to high-schools in the area and to thousands more who have thus increased their learning skills. The Hollywood Education and Literacy Project (H.E.L.P.) opened in 1997, as a single tutoring center utilizing Study Technology. Since then, H.E.L.P. has expanded beyond the Greater Los Angeles area, to now operate centers throughout the world. In the early years of the new century, Applied Scholastics centers in Hungary were established and have provided English as a Second Language training to hundreds of learners acquiring English skills necessary for their jobs and activities in the world’s economy. Since 2000, Study Technology centers have served schools in 12 US states under the No Child Left Behind law. As qualified Supplemental Education Service providers, they receive funding to deliver after-school tutoring to students from underperforming schools. One of the most significant events in Applied Scholastics history occurred in 2003, with the opening of the Applied Scholastics International headquarters and training center. This 100-acre campus, located in the Spanish Lake district of St. Louis, Missouri, serves as the emanation point from which Study Technology is made broadly available throughout the world. Since its opening, the number of teachers trained in Study Technology has doubled, with over 4,000 schools now employing Mr. Hubbard’s teaching methodology.